January has been a whirlwind of a month and I've picked up a ton of new products (seriously, check out my Instagram to see some of my hauls). But here are some products that I have love, love, loved throughout the entire month. Hourglass Ambient Lighting Powder in Dim Light: I was super late to the Hourglass Ambient Lighting Powder party, but now that I'm here I'm in love (I've also just ordered one of the new Ambient Lighting blushes...maybe that will make the cut as a February favorite). I had a difficult time in choosing which powder to order, even though I swatched them in person numerous times. I think the difficulty is because the powders are so subtle that if you only swatch them on your hands, they don't seem to be anything special. So, I ordered Dim Light (a neutral peach beige powder designed to blur imperfections) based on instinct alone. I'm sure I will end up picking up some other ones at some point, but in the meantime I'm enjoying Dim Light. It really does help to blur imperfections, keep shine at bay, and it adds a subtle, healthy glow to my cool-toned fair skin. Sarah Chapman Skinesis Overnight Facial: I think it was Lily Pebbles who originally inspired me to get this product around six months ago. I ordered it from the US Space NK website when they had an offer code. It's a bit pricey at $89 for 15mL/.5 fl. oz. but this is the nicest--and most effective--serum I have ever used. Whenever my skin is looking dull and uneven, or when I haven't been getting enough sleep, or when I've been eating too much sugar/wheat/junk (you get the idea), I will slap this on and without fail my skin will look 100x more radiant the next day. I don't know how it does it, but this serum, which has a moderately thick oil consistency with a beautiful floral/citrus scent, is a lifesaver. This has made it into previous blogposts (here and here), but I couldn't resist throwing this in again. Too Faced La Crème Lipstick in Jelly Bean: This is a recent purchase (I got it sometime in mid-January) but it is so good and is probably now my all time favorite lipstick EVER, so I felt it deserved a spot in this month's favorites. It has exceptional pigmentation and I love its glossy finish. I find that it wears quite well in terms of longevity and it is the most creamy, moisturizing feeling lipstick I've ever tried. The shade itself is a stunner--a bright berry shade. I've already picked up two other lipsticks from the La Crème line on the heels of Jelly Bean. Giorgio Armani Luminous Silk Foundation: As a beauty addict I think I will always want to test out new foundations, but I am sure I will always have a bottle of the Giorgio Armani Luminous Silk Foundation on hand. My shade, #4, is a perfect match and the finish of Luminous Silk has everything I could ask for in a foundation: medium coverage that can be built up, a luminous natural finish that stands up to my oily skin, and it photographs exceptionally well. Whether or not I'm having a good skin day, Luminous Silk always comes through for me. Le Métier de Beauté Creme Fresh Tint in Ginger Lily: This bad boy only recently made an appearance on my blog here but I've had it (and loved it) for months. It is a foolproof blush that works with any makeup look. 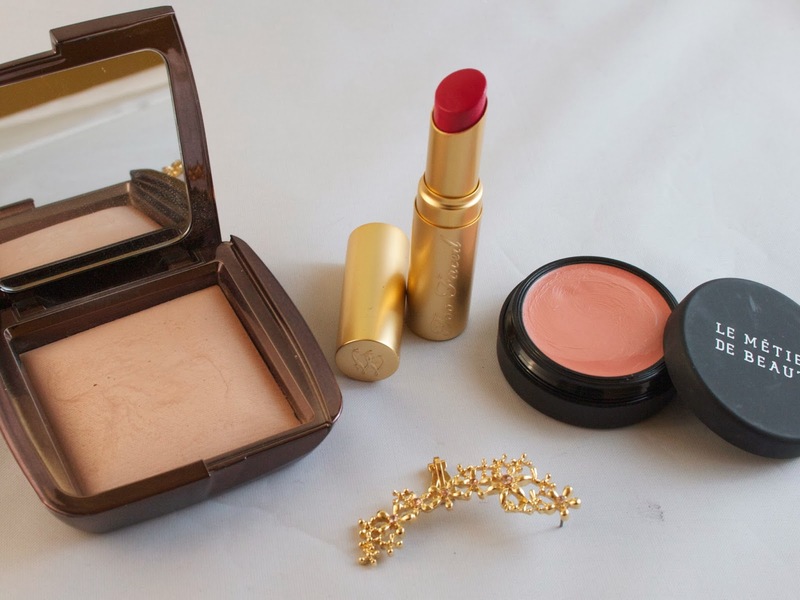 It is one of those blushes that makes you look chic and radiant, but entirely effortless. I also love that it retains a dewy finish and doesn't dry down to a powder. Living Proof Perfect Hair Day 5-in-1 Styling Treatment: One of my resolutions for 2014 was to get back into styling my hair. For months, I'd been too lazy to do anything with my hair. Literally anything...most days I would let it air dry and would not style it at all. My hair is fine but I have a ton of it, which results in thick hair that doesn't easily hold a style. Enter Perfect Hair Day (Ph.D., get it?) This styling cream claims to create shiny, smooth, strong hair with loads of volume. I definitely notice a huge difference on days when I use this (which is most days) and those on which I don't. It gives me great volume and really helps my hair hold a curl. Plus it smells amazing. Living Proof has now released a Perfect Hair Day Shampoo & Conditioner, which I plan to try out soon! 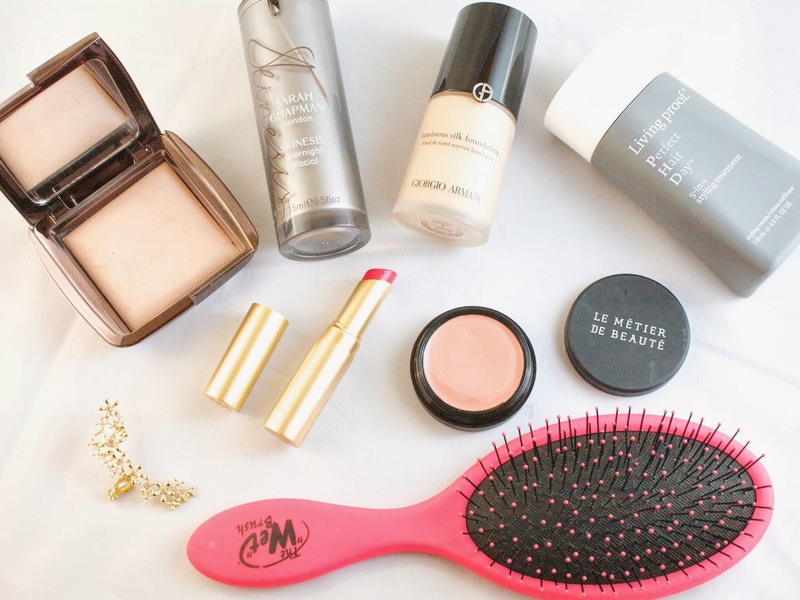 The WetBrush: For months on end, the beauty world was all about the Tangle Teezer. Then, all of a sudden, the WetBrush took over and became the hot commodity that everyone wanted to get their hands on. Including me. I never bought a Tangle Teezer, but it had become increasingly apparent that the wide tooth comb I had been using to brush through my wet hair just wasn't cutting it--every time I used it, copious amounts of hair would get ripped out of my head. I decided to see if the WetBrush could improve upon this, as it claimed to do. I picked one up from my local Target and I was floored at how well it lives up to its claims. It really will get through the tangliest of wet hair in one stroke--with little to no hair ripped out in the process. If this can work on my hair (which, since it is thin and I have a ton of it, gets tangled in the worst way), I'm fairly confident it could work for anyone. Forever 21 Ear Cuff: I am loving the earcuff trend taking place right now, but I never like to spend significant amounts of money on trendy jewelry items, both because they will eventually go out of style and also because I am prone to losing jewelry. 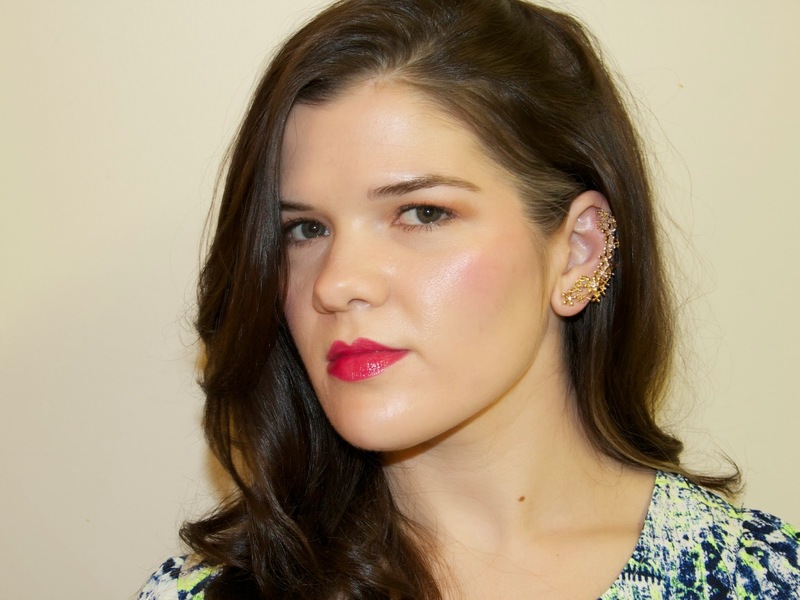 This Forever21 earcuff set solves both of those problems. At less than $5, it won't be tragic if/when I lose one of these. I would never wear these as a set (one at a time, please) but I think they are super stylish and I've received a lot of compliments on them! What have your favorites been this month? Have you tried any of the products above? Follow me on Bloglovin', Twitter and Instagram.